Recently, Billy Graham stated in his radio broadcast, “In these days we ought to hold our Bible in one hand and our newspaper in the other hand.” This is very true. We are living in terrifying and important times. It seems that the stage is being set right now as the Islamic drums of war beats to annihilate Israel. Acknowledging Muhammad as “the Prophet” is part of the SHAHADA which is the Islamic Creed “there is no god but Allah and Mohammed is his prophet.” To a Muslim fundamentalist that is a big deal. Allah is not the same as the Judean Christian God, Yahweh (the God of Abraham, Isaac and Jacob) but is in fact the moon god. When any President or Prime Minister of any nation like the US President Obama did at the UN Assembly in September 2012, referring to “the prophet Muhammad” to the Muslim world he was actually giving the impression and acknowledgement that the US is already in subjection to Shariah law or Shahada. To speak about Islam and refer to “the prophet Muhammad” could knowingly or unknowingly be dangerous for the West. ISLAM means “submission!” Once a non-Muslim submits to the Shahada he or she becomes a DHIMMI (non-Muslim living under Muslim control and protection). Theoretically the “Dhimmi” is then free to practice his or her own faith as long as…he or she respects Islam and its prophet. To formalize this new confession, the Dhimmi is then required to pay the JIZYA which is a tax commanded by the Koran to be imposed on all non-Muslim’s (Dhimmi’s) who lives under the protection of Islam. And ,since the US is already paying billions of US Dollars to Egypt, Libya, Pakistan and other Middle Eastern nations and amazingly keeps offering to give them more… One could certainly argue that the US is already paying the Jizya Tax. Is this done as a way of appeasement, only God knows? Psalm 83 describes a continuing conflict between Israel and its neighbours… which climaxes with a final victory for Israel over her adversaries. It is a prayer in which Israel pleads for deliverance from a confederacy of enemy nations that are in union for the single purpose of destroying her. Events over the past years that are escalating and bringing this Psalm into focus and make the prophecy seem all too real. “Everything that the experts say and everything that the activists and politicians have taken for granted for a generation is really off the table… What’s been happening first in Lebanon and then in Tunisia and now in Egypt and Syria… who knows further a field suggests that new forces have been unleashed and we have no idea where they might lead and what new dynamics they might create.” Thanassis Cambanis, Middle East Corresp. Israel is "the Target"…! Israel is now facing its most dangerous scenario since the 1967 war. There is a Hezbollah-led government in Lebanon and with the Muslim Brotherhood in Syria, Jordan (Jordan’s Muslim Brotherhood has moved forward… from opposition propaganda, debating and political pressure… to activism against the throne), and now in Egypt with President Morsi ready to embrace an Islamic form of government in the mould of Iran. The Palestinian Authority has also once again asked the U.N. to recognize the West Bank, Gaza, and East Jerusalem as the sovereign nation of Palestine — based on the pre-1967 borders. Surely, it must grieve the Lord that the modern state of Israel has already given so much of her inheritance away to the Arabs… It most sincerely grieves and annoys Christians to see historical biblical places like; Bethlehem, Hebron, Bethany and Jericho in Palestinian Hands at present. God led Israel to triumph in the 6th Day War (1967) so that she could reclaim the whole of her inheritance but her past and present leaders have been duped by their "so-called" friends into believing that they can trade land for peace. Together, they are now planning to establish a separate Palestinian state within the geographical boundaries of what has historically been Israeli ground. They hope that this will appease the Arab world… but this kind of thinking is equivalent to committing suicide. The activities of terrorist organizations like Hezbollah and Hamas should never surprise anyone… lies; deception and trickery are to be expected when dealing with those who carry out Satan’s assignments. Tragically, many Western World Leaders cannot see through them. Many are just simply too afraid to oppose them, because they have lots of oil and are easily inflamed. The Bible prophets; Zechariah, Ezekiel, and Isaiah all prophesy that, in the last days, a reborn nation of Israel will find herself alone and friendless with her back to the sea, surrounded by enemies with no one and nowhere to turn. Does this sound familiar? Yes, those days are here! The perils to Israel seem to grow day-by-day and seldom have we seen a nation face — at one moment — so many lethal threats to its very existence! The turn in Egypt’s relations with Israel is unmistakable… as Morsi wants to bring the whole Middle East into submission of Shariah law with Jerusalem as the final prize. In addition to this hostile enemy on its southern flank, a worldwide political storm gathers against Israel in the United Nations. With the 1967 Borders, Israel would only be nine miles wide at one critical point. It would mean that from the hills of the West Bank (Palestine) the terrorists can physically see Tel Aviv. Important: That would be child’s play for the rockets and missiles of the terrorists or the national military of their new state to reach Tel Aviv. Further, Israel would no longer have the recognized right to enter Judea or Samaria (the West Bank) or East Jerusalem to protect Jewish settlers, tourists, or any of the Jewish or Christian holy sites. 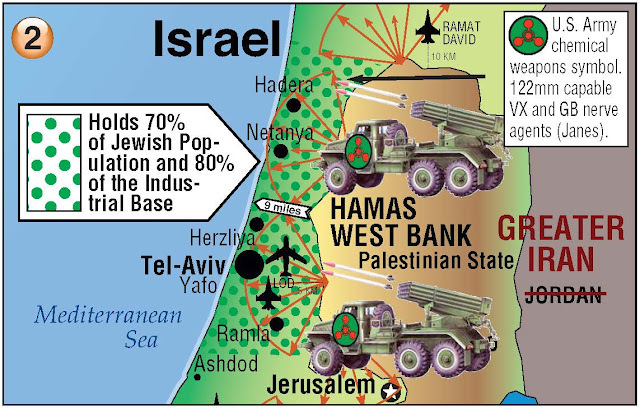 They could no longer enter those areas or Gaza to destroy missile and rocket launch sites operated by the Palestinians. To do so would be seen as an invasion of sovereign territory and give cause to the Palestinian "allies" to rush to their aid. Such a turn of events will only embolden Israel’s sworn enemies. "Revered Israeli statesman, Abba Eban, once referred to those indefensible borders as the "Auschwitz borders" because of the danger they posed to Israel. There is no question that Egypt is going to turn on Israel very soon... God has never been wrong in any of His prophecies, and if He shows us Egypt will be numbered in the Psalm 83 war against Israel with their Arab neighbours than there is little question as to what direction Egypt will go. Most of the world and many Christians are paying little heed to the biblical prophecies of the Middle East and millions of people are living their lives as if these prophecies just don’t exist even though the world is entering into a new crisis! Only God knows the time and the place… but events in the Middle East point to a fulfilment of prophecy! Now, more than ever, we need to familiarize ourselves with the prophecies of Isaiah 17 and 19, Jeremiah 49, Psalm 83, and Ezekiel 38 and 39. 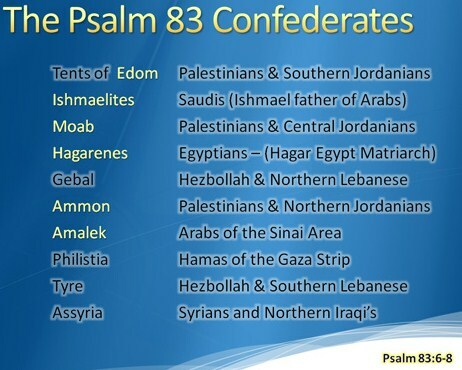 Here is what's important to understand… Psalm 83 is about Israel’s conquest over the inner circle of the surrounding Arab populations of Palestinians, Jordanians, Syrians, Lebanese, Saudis and Egyptians. The final result of such a war is that Israel’s borders would be enlarged, prosperity would be increased, and their national stature greatly enhanced. This has to happen before Ezekiel 38 – 39. Why? We know that in Ezekiel 38 there is a Russian-Iranian led coalition that will attempt to invade a militarily secure Israel. This condition of security becomes a reality only after the judgments are executed upon the surrounding Psalm 83 nations. If Iran is weakened (so to speak), then other Muslim nations will band together to "defeat" Israel. As we have seen Psalm 83 identifies these nations who come against Israel. Possibly once the Psalm 83 war is complete, Israel will have accomplished all the pre-requisites for the Ezekiel 38-39 war (Gog and Magog). What about Isaiah 17…? Perhaps the Psalm 83 war includes the events described in Isaiah 17. Some think it will be part of the Ezekiel 38 war. Either way, Damascus (the present Capital of Syria and the oldest continuously inhabited city in the world) becomes a wasteland, as if a nuclear strike had taken place. The prophecy also says that Israel is negatively impacted by this. Syria has thousands of chemical and biological warheads pointed at Israel, many of them hidden in Lebanon. We always need to keep in mind what the Prophet Zechariah said; "And in that day will I make Jerusalem a burdensome stone for all people: all that burden themselves with it shall be cut in pieces, though all the people of the earth be gathered together against it." We are already witnessing Israel’s allies beginning to turn away from her as seen in Zechariah 12:3. Israel now only has a few allies left and they are on the road to backing away from her as well. Turkey once allied with Israel… has become another foe to Israel. Egypt has a peace treaty in place with Israel, but that treaty will soon be taken away. It is very possible that Morsi the President of Egypt will turn on Israel to come more in line with his Arab Brothers and the Muslim Brotherhood. If Iran is attacked by Israel it would strengthen the union given us in Psalm 83. Since all the nations bordering Israel attack Israel, Egypt would forget about the shaky peace pact and attack Israel thinking once and for all Israel will be wiped out as a nation. We will have to wait and see what happens but the outcome is always going to be the same, Israel will be attacked and Egypt will be one of those nations who will try to wipe her out. The Psalm 83 war is much different from the Ezekiel 38 war… If you notice Ezekiel 38:11 says Israel will be the land of “un-walled” villages, “at rest” – “dwelling safely” and “having neither bars nor gates.” When the Ezekiel war begins Israel won’t have any walls up or anything stopping people from moving around as we see in Israel today. The Psalm 83 war will break out while the peace talks are going on and while Israel has these protective walls. When the Psalm 83 war is over and Israel takes more spoil away from the nations who invade her, she will feel safe and no doubt remove the walls, bars and gates as we see in the Ezekiel prophecy. The news today shows us the first war to be fought will be the Psalm 83 war because of these walls. The area is so volatile that… If Israel was to cease to exist tomorrow; there would be NO peace among her neighbours. The Middle East maze is illusive and deceptive, replete with mine fields for one who delves in looking for simple answers. Israel is here to stay… and, her Arab neighbours will have to learn that the Jewish State is a part of the future for the Middle East. Israeli’s are convinced that they may at times have to plod along ALONE on the International scene… and they are ably prepared for such a struggle. They WILL strive to maintain and to enhance their prized democracy in Israel whilst surrounded by a sea of hostile Arab Islamic nations, even as they provide a haven for oppressed Jews around the world as anti-Semitism rises! Certainly the United States has provided funds to Israel on a yearly basis… but for her part Israel has remained a loyal ally surrounded by an anti-Western, anti-democratic Muslim culture. We must also remember that the US provides a number of Arab countries with funds and arms as well and many of these nations are bent upon the destruction of Israel. For certain and for the time being, America’s interests lie in a strong Israel even as ties between the two nations run broad and deep. BUT, Israel can’t (and does not) count on the United States remaining sympathetic to her plight or responsive to her needs. A number of American Administrations and her State Department officials have many times worked against Israel’s interests. Still, the Israeli’s admire the US and the democratic tradition for which they stand. Israeli’s also admire the many Christians that love and support Israel in the US and around the world. Iran is dangerously confessing that Islam is preparing for their final Imam… ‘A Revolutionary Guards arm, the Holy Defence,’ of Iran published a book, “The Last Six Months,” in which it describes the conditions needed in the last six months prior to the reappearance of the last Islamic Mahdi. The book was distributed in the hundreds of thousands to all Guards, Basij and army bases throughout the country. Islam’s Shiites believe their 12th Imam, Mahdi, will reappear at the end of times and kill all the infidels (non-Muslims), raising the flag of Islam in all four corners of the world. The book, which relies on Islamic hadiths by their prophet Mohammad and his descendants from centuries ago, describes the US 9/11 attacks and the invasions of Afghanistan and Iraq as signs that the time is near. But… it also prophesies much more significant signs that would launch the six-month time frame for the reappearance of Mahdi; an attack on Syria and then an attack on Iran. In other places the same desire to destroy Israel continues. Whether it is in the wider Arab world or the mad men of Iran or some of the leaders of western nations, the goal is ever present. We DON’T know exactly which course events will take but… we DO know from scripture the details of some things that lay ahead! 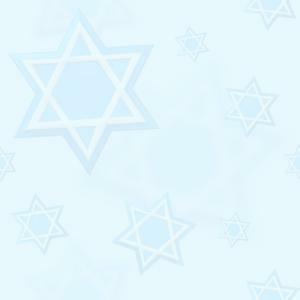 We DO know that Iran will NOT destroy Israel; God’s program for Israel will be carried forward. We DO know that the scenario of the war of Psalm 83 is rapidly falling into place. In fact it seems to be almost complete! We DO know that Iran will not be directly involved in the war of Psalm 83 as the nations and groups involved in this war are listed in Psalm 83:6-8, and Iran is not listed there! We DO know that we are living in very dangerous times and that the war of Psalm 83 will be one of the most devastating wars of history up until its time (Psalm 83, Isaiah 17, Ezekiel 35-36 and Obadiah 18). Chemical, biological and nuclear weapons may well be a part of this war. Such weapons are held by some of the nations named in scripture as combatants in this war. An impending world-wide economic collapse could be brought on by this war. The loss of resulting availability of oil is enough to push the world to the brink of disaster. This could happen if the war is advanced by an Israeli attack on Iran. The post-war climate could be the ideal climate for the coming Antichrist to bring about a world-wide peace treaty accompanied with world-wide disarmament which will leave him in control of all the nuclear weapons. The world will evidently yield to him the control of the economy; agriculture; the world courts and possibly the UN. He will proceed to work great miracles to put a broken world back together, at least temporarily. The scriptures tell us of the disaster which will follow this peace treaty and of the chaos that will take place as the tribulation period unfolds. The Lord is allowing this power shift in the Middle East to occur in His divine sovereignty… Perhaps it is because the Jewish State is now firmly established among the nations of the world. It might also be because there are as many Jews in Israel today as were lost in the Holocaust. Most likely it is simply because God’s appointed time has come for the final act of human history to be played out. No matter what the reason, it is setting the nations on a new course towards Armageddon. Things are moving forward in accordance with prophetic Word of God Almighty. We can therefore be rest assured that He has everything perfectly under His control! Hitler was not the first Gentile ruler to think of wiping out the Jewish nation once and for all… Two other wicked men… both of whom tried the same thing long ago, stands out in history. Coincidentally, their names also begin with “H” – ‘Haman’ and ‘Hadrian the hateful’ as does the word Holocaust but the God of Israel has foiled every attempt to annihilate His people and has preserved them because they have a divine destiny to fulfill. Once again we cannot be certain as to exactly how the present scenario will unfold... But, the one thing that one cannot reasonably deny is the fact that the end time events foretold in God’s Word are even now beginning to happen. We are without doubt heading toward some cataclysmic events. The trumpet is soon to sound and God’s people, those in Christ, will be caught up into the presence of God. What all the Arabs simply do not understand is that they are fighting God Almighty, the One God of the universe, the Holy One of Israel… God has not only made many promises of protection to Israel and promises of physical destruction to the Arabs, He has made the precise carrying out of these prophecies a matter of honour to His Mighty Name. This honour is so serious in God's eyes, that, IF the Arabs succeed in destroying Israel… you can destroy your Bibles and look for another religion in which to believe! God will have been proven to be a liar, and worse, powerless! 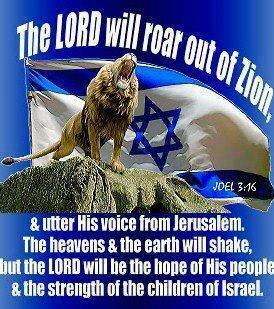 In this time, we must pray for Israel and for her protection. She has been the victim of a racial hatred as strong as any in world history. The Arabs, who have hated her for so long, are going to try this one last time to destroy her, but this time God is going to eradicate the Arabs.